The Height Above Ground (HAG) filter takes as input a point cloud with Classification set to 2 for ground points. It creates a new dimension, HeightAboveGround, that contains the normalized height values. 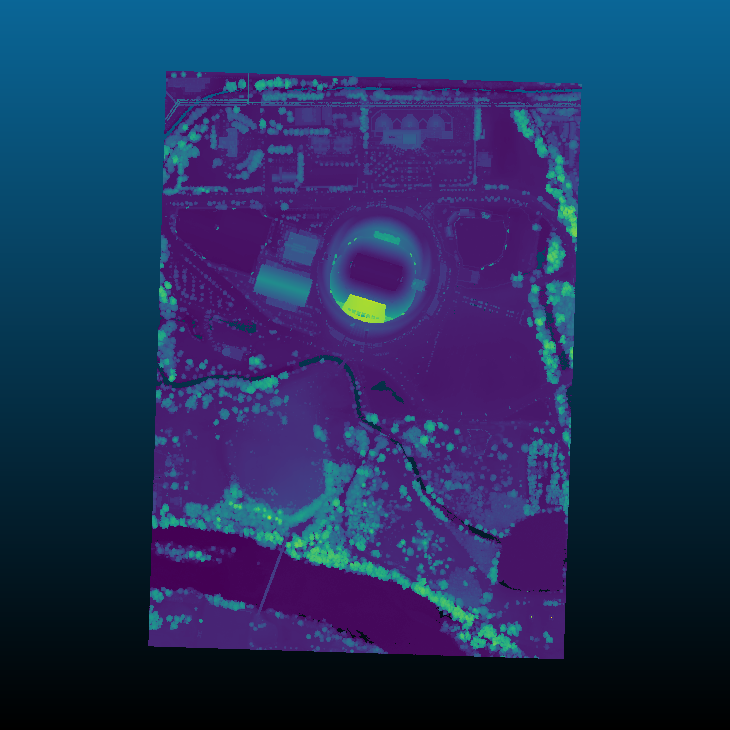 We expect ground returns to have the classification value of 2 in keeping with the ASPRS Standard LIDAR Point Classes. Ground points may be generated by filters.pmf or filters.smrf (see Identifying ground returns using ProgressiveMorphologicalFilter segmentation), but you can use any method you choose, as long as the ground returns are marked. Normalized heights are a commonly used attribute of point cloud data. This can also be referred to as height above ground (HAG) or above ground level (AGL) heights. In the end, it is simply a measure of a point’s relative height as opposed to its raw elevation value. The HAG filter works by iterating through all points, finding the nearest neighbor (in XY only) amongst the ground points, and computing the distance between the two Z values. The process of computing normalized heights is straightforward. First, we must have an estimate of the underlying terrain model. With this we can compute the difference between each point’s elevation and the elevation of the terrain model at the same XY coordinate. The quality of the normalized heights will be a function of the quality of the terrain model, which of course depends on the quality of the ground segmentation approach and any interpolation that is required to arrive at the terrain elevation for a given XY coordinate. We will use a nearest neighbor interpolation scheme to estimate terrain elevations. To compute the normalized heights, we first create a 2D KdTree (X and Y only) to accelerate our nearest neighbor search. The tree is composed of only ground returns. We then iterate over each of our points, searching for the nearest neighbor in the ground points. We then compute the difference between the elevation of the query point and the nearest neighbor in the ground set. This value is encoded as a new dimension called HeightAboveGround.